Welcome to the Historic Plantation Manager’s Beach Home. In the 1930’s, 40’s and 50’s there were few hotels on the island of Hawai’i. Most visitors were welcomed in people’s homes. Guests from all over the world came to stay at our house in Pa‘auilo where Robbie was the plantation manager. ​On the weekends, Marjorie and Robbie would invite them to their beach house in Kona. In the 1940’s, Kona was “off the grid.” There was no electricity. Food was kept in “ice boxes” cooled with blocks of ice made in Kailua. Lighting was provided by kerosene lamps or Coleman lanterns. Drinking water was captured from the roof and stored a series of three redwood water tanks, the highest one being higher than the house so it could supply water pressure. Water for bathing was heated by a solar hot water heater that Robbie designed. It worked very well unless someone took too long in the shower. There was no heating or cooling system; instead the home was designed to face the ocean and be one room wide so that the sea breeze could cool it during the day and the mountain air could cool it at night. With the exception of some added fans, this aspect remains true to this day. Today things have changed. We have a County water and sewer system, electricity, and natural gas, and have added a 50 inch flat screen television. As you enter the front door, you are greeted by a portrait of Robbie painted by Jeanne Inglis, a member of the Royal Academy of Portrait Artists. Jeanne was Robbie’s nurse after he was very badly injured in the Battle of Highwood in WWI. In 1937, after Robbie became plantation manager, he went back to England and visited Ms. Inglis. He brought her some kapa (Hawaiian cloth). She painted his portrait and gave it to him. In the background of the portrait is his gift to her. The house is full of pictures painted by Robbie and his pals. ​This is where we live! It is great for informal meals. On most days we can see a school of dolphins go by. In the winter if you are lucky you may look out past the palm trees and see whales jumping. Don’t forget to keep the doors to the house closed. A pair of cardinals will come and want to have breakfast with you. Sometimes they get in the house and are hard to shoo outside. 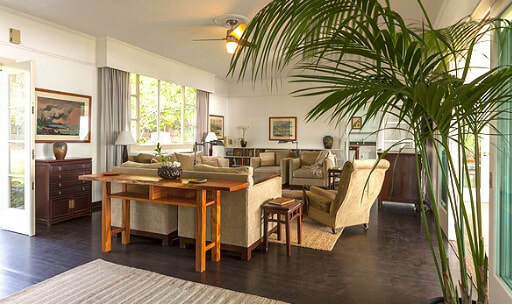 Gwen Williams (Ian’s godmother) encouraged Marjorie and Robbie to add this lanai to the house. 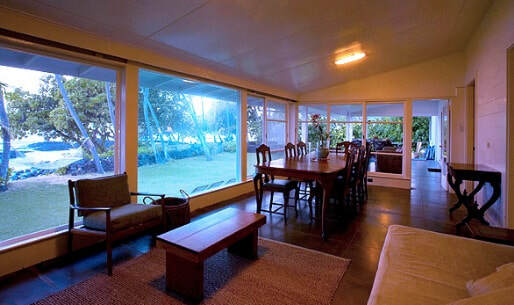 “Every house in Hawai’i has to have an outside covered lanai”. Val Ossipoff, Hawai‘i’s most distinguished architect, came over for drinks one afternoon and sketched it out; several months later S.K. Oda, a Hilo contractor, sent over a crew of masons and carpenters and built the lanai. Note the extraordinary stonework. We are forever grateful to Gwen, Val, and S.K! In the old days Robbie and his pals, Millard Sheets (a renowned artist), Muggs Van Sant (whose son Tom is also a renowned artist), Roger Williams, and Hiroshi Hiramoto would sit on this lanai and play cribbage. Robbie, Millard and Mugs would set up their easels in the morning, sketch in their drawings and then wait for the light to be perfect. Plantation managers were expected to accommodate visitors at their homes. Meals were formal affairs with servants, linens and silverware. The manager provided his own furniture. Robbie needed a dining room table that could seat 10 easily and 12 in a pinch. He purchased some koa wood from Kapapala Ranch here on Hawaii and had it sent to Hong Kong to be made into a table and chairs. The sideboard belonged to Marjorie’s grandmother, a proud member of D.A.R. and a “pillar of society” in Hornellsville, New York. Also in this room is a punee (day bed) that can be used by overflow guests. After breakfast, Marjorie would take some papaya down to the ocean and whistle for her friend “Minnie the Manta.” Usually an enormous manta ray would glide in to see his (her) friend and investigate Marjorie’s morning offering. ​When the house was first built, ice would be delivered to Kona once a week by truck. 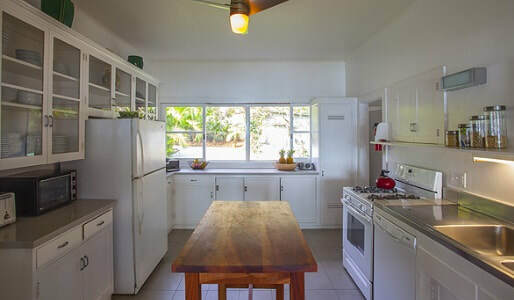 Today, the house has all the modern amenities: a full sized refrigerator, gas stove, oven, microwave, and dishwasher. Just off the kitchen, there is a laundry room with a washer and dryer and wash tub. Outside, there is a paepae (patio) for outdoor BBQ grilling. As is typical of many beachfront homes, there is a bathroom here that can be accessed from outdoors. This is the perfect way to rinse off from a beach adventure without tracking sand into the main house. Originally, this bedroom was Robbie’s office. After he died, Marjorie turned it into her bedroom. 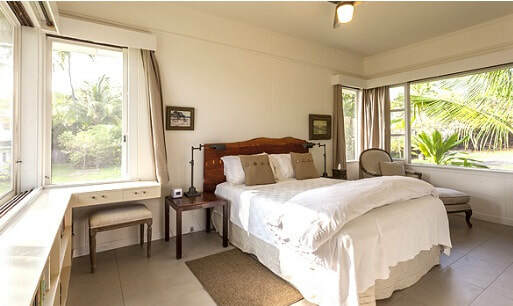 ​This bedroom has a king size bed, two closets and an adjacent full bathroom with a shower. ​This was Ian’s room when he was growing up. Dylan and Katie like this bedroom the best. The bedroom has a king-size bed and Marjorie’s grandmother’s chest of drawers. There is an adjacent full bathroom with shower over claw footed tub. 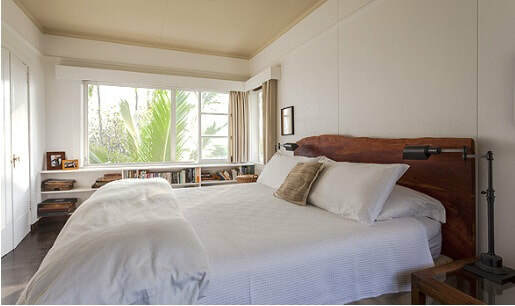 ​This was, originally, the master bedroom. Some people like it the best. 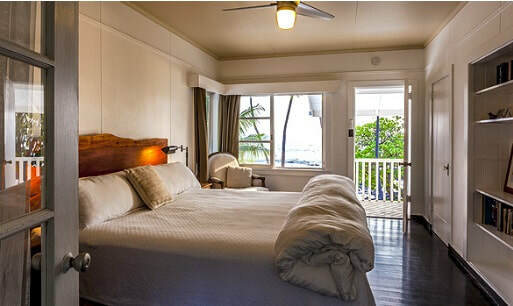 It has a king size bed with fabulous views as it directly looks out over one of the two sandy beaches through the palm trees swaying in the wind. When Dylan and Katie married we had the wedding on the promontory and dinner and dancing in the front yard under a tent. When Dylan first started dating Katie, Barbara, who is an excellent athlete, took Katie out in the front yard to show her how to throw a football. Katie threw the ball over Barbara and over the fence and almost beyond the Zen Cottage front yard. Barbara did not know that Katie’s Granddad was an All American quarterback. 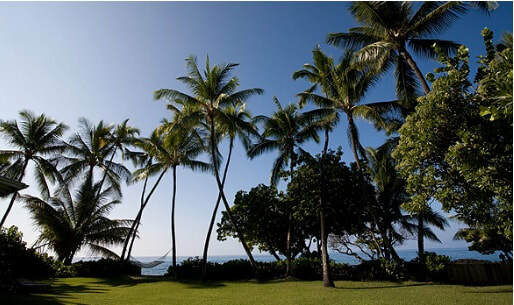 We welcome guests from all over the world to come and stay with us and enjoy our lanai, our beaches and our lagoon.